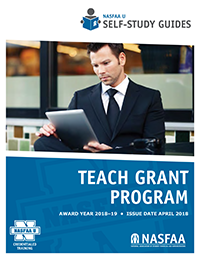 This self-study guide introduces learners to the Teacher Education Assistance for College and Higher Education (TEACH) Grant Program, including institutional and student eligibility, awarding funds, the Agreement to Serve, and counseling requirements. The guide includes quizzes, reflection questions, and learning activities which reinforce the content presented. Completion of this guide qualifies an individual to take the credential test on the TEACH Grant Program. Be able to make institutional and academic program eligibility determinations required under the TEACH Grant Program. Understand when recalculations are required and optional. Understand the TEACH Grant counseling requirements.